Happy 2018 and welcome to a new year of NCTQ's District Trendline! In light of new research regarding performance pay, this month's Trendline takes a look at how a teacher's evaluation rating affects salary in some of the largest districts in each state and across the country. Performance pay is defined in many different ways, but for this Trendline we examine only those pay increases that are tied to a teacher's evaluation rating - which may or may not incorporate student achievement metrics. We should also note that we are only considering pay increases that do not require teachers to complete any extra work, such as attaining National Board Certification or serving in leadership positions. An annual salary increase, where the performance-based compensation a teacher earns is a raise and becomes a guaranteed, permanent part of her base salary in all future years. An annual bonus, where a teacher is awarded money based on her performance in a given year and must re-earn the bonus each year. Overall, 51 of 124 districts, or about 40 percent, provide some form of performance pay that fall into the categories described above. Ten of these districts offer opportunities for both performance-based salary adjustments and performance-based bonuses, and will therefore be included in both sections of this post. Of the 51 districts with some type of performance pay, almost all of them (49 districts), do so in a way that ties evaluation to permanent increases to salary. Of these 49 districts that tie evaluation results to salary decisions in some way, the majority (31 districts) have a version of performance pay that only freezes salaries for underperforming teachers, rather than providing additional compensation for the best teachers. In these districts, a teacher with poor summative evaluation stays on her current step while a teacher who earns an effective or highly effective rating proceeds to the next step on the salary schedule. While these systems differentiate between teachers based on performance, they do not fulfil the goal of rewarding the best teachers because a highly effective teacher's salary does not increase any more than that of an effective teacher. In addition, these policies are likely to affect only a tiny percentage of teachers in a district, as most districts assign virtually all teachers satisfactory ratings. In addition to the 31 districts that use salary freezes as their only form of performance pay, 16 districts have systems that not only freeze pay for teachers who are not effective, but also reward the highest performing teachers with the largest salary raises. In these 16 districts, unlike the districts discussed above, highly effective teachers earn larger raises than teachers with effective ratings. Almost all of these districts – 13 – are in the state of Florida. That's because Florida law requires that all teachers hired after 2011 be placed on a performance pay salary schedule that awards annual salary increases only to teachers rated effective or highly effective, with highly effective teachers receiving the largest compensation bump. Dallas Independent School District, District of Columbia Public Schools, and Douglas County School District (CO) are the three other districts that award salary increases based on evaluation. Details about the performance pay systems in these three districts are in the table below (click links below for additional information). Dallas Independent School District A teacher's evaluation rating determines if she moves up or down an "effectiveness level," of which the district has nine. A teacher's effectiveness level then determines her compensation. In most cases, teachers can only move one effectiveness level per year. To progress to any of the five highest effectiveness levels out of the nine, teachers must undergo the optional "Distinguished Teacher Review" process, which examines a variety of factors in addition to evaluation rating, such as "contributions to the profession." Teachers who do not undergo this process still earn a salary increase tied to their evaluation rating, but are not eligible for the largest salary increases and highest salary levels. District of Columbia Public Schools Teachers with multiple years of highly effective ratings move through the salary schedule at an accelerated rate, gaining multiple pay steps at once, and are eligible to move to the master's degree and PhD salary lanes without actually having an advanced degree. Accelerated movement through the salary schedule and the accompanying salary increases are only available to teachers who work in the district's high-poverty schools, and more than 75 percent of the district's teachers work in such schools. Douglas County School District All highly effective teachers, regardless of their grade/subject, receive a higher percentage salary increase than all effective teachers. Teacher supply and demand play a role in annual compensation increases. For example, the district has an easier time filling its elementary positions than its upper level math positions, and so an effective high school math teacher would receive a larger salary increase than an effective elementary teacher. Baltimore City Public School System and Milwaukee Public Schools fall into the "other" category in the graph above due to their less conventional approaches to performance-based salary increases. Milwaukee teachers who earn a distinguished evaluation rating in their sixth year of teaching earn a raise of $1,500, but the district provides no other opportunities for evaluation-based permanent salary increases. Interestingly, Baltimore has an integrated system that requires teachers to earn 12 "achievement units" to move one step on the salary schedule; there are multiple ways to earn achievement units, but a highly effective evaluation alone earns all 12 necessary for advancement and an effective evaluation earns 9 achievement units. The system rewards performance by virtue of allowing all highly effective teachers to automatically move to the next step, but teachers can also earn their 12 achievements units for activities and accomplishments, such as participating in professional development, that are not clearly tied to their effectiveness. In addition to the districts discussed above, where a teacher's evaluation impacts her base salary, some districts approach a performance-based compensation in a different way: through bonuses that must be re-earned each year and do not become part of a teacher's salary. 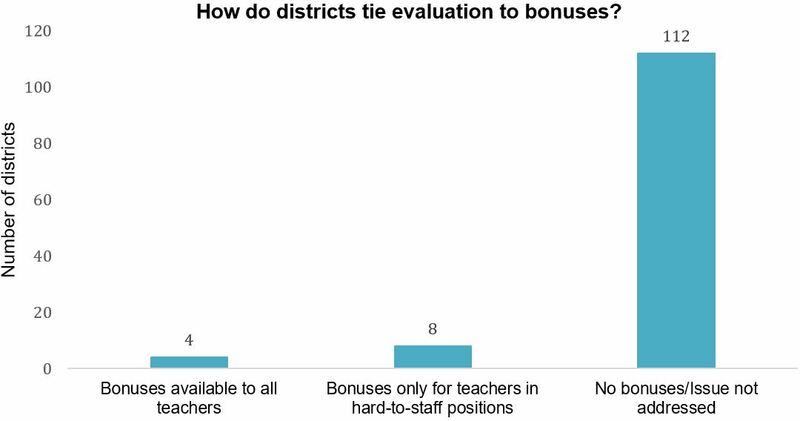 Close to ten percent (12 districts) provide bonuses based on evaluation results available to some or all teachers, typically rewarding highly effective teachers with the largest bonuses. Aldine Independent School District (TX), District of Columbia Public Schools, Newark Public Schools, and Milwaukee Public Schools provide opportunities for all teachers to earn bonuses if they achieve the highest evaluation rating. However, Milwaukee teachers are only eligible for this bonus one time, in their third year of teaching; this bonus is separate from the performance-based raise Milwaukee teachers can earn in their sixth year that we mentioned earlier. District of Columbia Public Schools offers significant performance bonuses that are available to all highly effective teachers, but are larger for teachers in hard-to-staff schools. It is important to note that these bonuses are separate from and in addition to the salary increases discussed earlier, and a teacher can earn both. Teachers in low-poverty D.C. schools receive either a $2,000 bonus or a $3,000 bonus if they teach a tested grade and subject, whereas teachers in high-poverty schools receive either a $10,000 bonus or a $15,000 bonus if they teach a tested grade and subject. If these teachers work in one of the 40 lowest performing schools, they receive an additional $10,000, for a maximum total bonus of $25,000 for a highly effective educator teaching a tested course at high-poverty, low-performing school. Newark, like the District of Columbia, offers bonuses to all highly effective teachers, but offers larger bonuses to teachers in hard-to-staff positions. Some districts limit performance bonuses to only teachers in hard-to-staff positions. For example, Seattle Public Schools awards a $2,000 stipend to teachers in low-performing schools who have a good evaluation rating, but no such bonus is available to effective teachers in high performing schools. Although performance pay has dominated teacher compensation discussions and many education reform platforms over the past decade, this analysis reveals that more than half of large districts across the country and in each state still do not tie evaluation results directly to compensation in some way. Furthermore, only a small fraction of districts have compensation plans in place that distinguish between highly effective and effective teachers when making performance-based salary adjustments or awarding bonuses. For this Trendline we only considered evaluations, but 17 districts also offer additional pay to teachers based on measures of performance other than evaluation rating, such as student AP scores or school-wide performance metrics. Some of these 17 districts also have performance pay based on evaluation rating, and so are included in this analysis. Some districts freeze the pay of any teacher rated less than effective, while other districts only freeze pay for teachers with the lowest possible evaluation rating. For example, some districts with four possible evaluation ratings (e.g. ineffective, developing, effective, and highly effective) may freeze pay for ineffective and developing teachers, whereas others may only freeze pay for ineffective teachers.